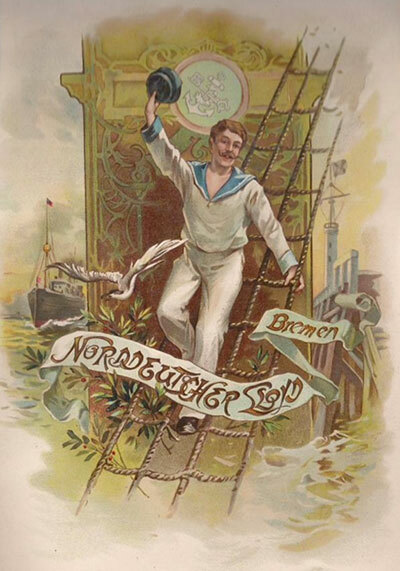 The North German Lloyd Company, Norddeutsche Lloyd, (NDL) of Bremen was founded in 1857 and became one of the leading shipping companies in Europe. 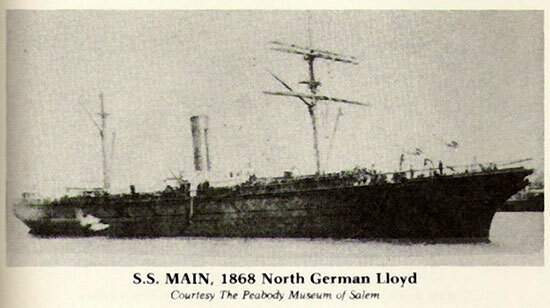 This page will take a look at the North German Lloyd, some of its ships, and some of its seamen in the period between the founding of the company and the 1870s. Some of my relatives (particularly the Petermanns) sailed out of Bremen before the North German Lloyd was formed. Information on the ships they sailed on can be found under the individuals and their specific experiences at sea. See bottom of the page. Bremen, with its port at Bremerhaven, was one of the major shipping centers in Europe in the mid to late 1800s, a period of major German immigration to the United States. My great grandfather, J. Berend Petermann born 1843 in Ganderkesee, son of Johann Christopher Petermann and Gesche Margarethe Engelbart, spent 14 years at sea and traveled all over the world. He married in Germany and immigrated to the United States where he settled in Hoboken, New Jersey. Joh Hem Petermann born 180(?) Ganderkere, residence,	Elmeloh enlisted 17 Okt 1837 (17 Oct 1837), Ship Hercules, Bremen to the Westindische (West Indies) Archive Name:	Bremen Staatsarchiv. Crew lists. Not listed Sailors Registery. Before the North German LLoyd was formed. Johann Heinrich Petermann, born c 1806, Ganderkersee, residence Elmeloh. He was at sea from 1832 to 1842, before the formation of the North German Lloyd lines. Friedr Petermann born	1810 Ganderkesee, Residence Ganderkesee. Enlisted 27 Okt 1845 (27 Oct 1845), Ship	Ann Bremen to Baltimore, Maryland Archive Name:	Bremen Staatsarchiv Archive Collection:	4,24-E.7 Musterungslisten der Schiffe, gefuhrt vom Bremer Wasserschout, 1837 Juli- 1873 Crew Lists. Pre North German Lloyd. Johann Berend Petermann, born 1812, Ganderkesee, residence Landwehr. He was at sea from 1832 to 1842, before the formation of the North German Lloyd. I am not sure exactly who he was but he was the witness to the baptism of Johann Hirnrich Petermnn born 1840. Friedrich Petermann, born circa 1820 Ganderkesee was a ship's cook. He made multiple sailings between 1839 to 1871. He signed up for over 43 tours - many to the USA: Baltimore, Charlestown, Galveston, New Orleans and New York. He was on the same ship as Johann Heinrich (born 1806) in 1839. He was also on the same ship as Berend (born 1843) and Johann Heinrich (born 1852) in May 1870 (the Bark Texas to the USA). Johann Heinrich Petermann, born 1840 Ganderkesee, the brother of J. Berend Petermann did 15 tours between 1858 and 1871. The vessels he sailed on were not North German Lloyd, but I have not yet found who they belonged to. Joh Hinr Petermann 1852, Ganderkesee, residence Ganderkesee made 5 tours between 1864 and 1870. Again the ships were not part of the North German Lloyd fleet. Johann Heinrich Englbert (Engelbart) born 1817 Ganderkesee served on the Hudson to Greenland in the winters between 1865 and 1871. Johann Heinrich Englebart born 1847 Ganderkesee, son of Johann Heinrich born 1817, served on six tours between 1862 and 1871. My husband's great grandfather, Henry Blanck, was born in Lehe (a suburb of Bremerhaven) in 1849. He spent 3 years with the North German Lloyd Steamship Company between 1868 and 1870 - traveling between Bremen and New York with trips to Havana, Cuba and New Orleans. He immigrated to Hoboken, New Jersey in 1871 by deserting ship on his last voyage. His brother, Hermann Blanck, spent two years with the North German Lloyd. He made at least three voyages with Henry Blanck. He then disappears from the records. 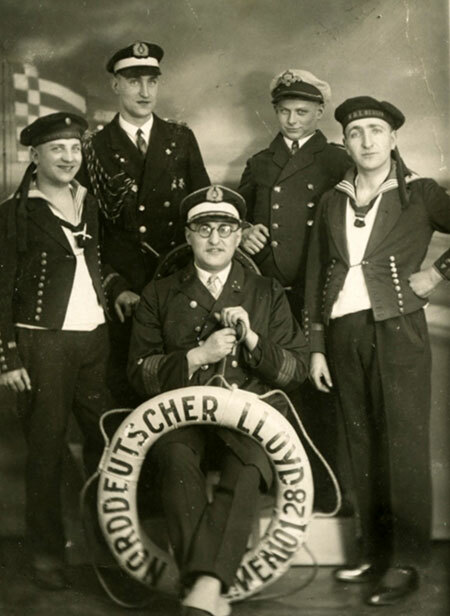 Henry Blanck's future brother-in-laws, Fredrich Erxmeyer served on the North German Lloyd and deserted in Hoboken. 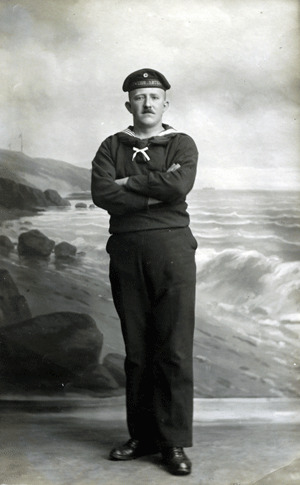 Henrich Erxmeyer, brother of Freidich, also served on the North German Lloyd and deserted in Hoboken. Johann Lehmann another brother-in-law served with the North German LLoyd. and deserted in Hoboken. 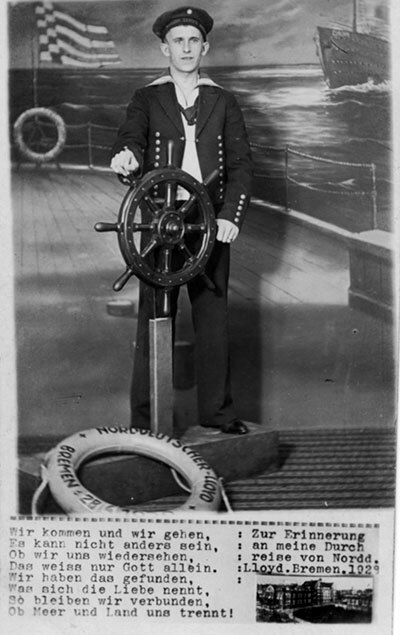 Hienrich Reddehase, another brother-in-law of Freidrich Erxmeyer, deserted ship in New York. Johann William Lange born Rustorf 1845 married Frederick Erxmeyer's wife's sister, Catherine Reddehase. 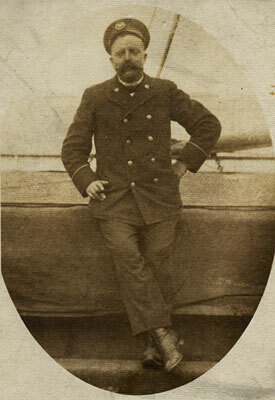 J. Wilhelm Lange made 7 tours with the North German Lloyd between 1868 and 1872 when he deserted ship in New York. The piers of the North German Lloyd Steamship Company in New York Harbor were in Hoboken, New Jersey. While the port was listed as "New York" the ships actually docked in Hoboken, New Jersey. When a sailor signed up for a tour of duty it does not appear that he signed up for a specific length of time. The length of service was clearly determined at the end of the enlistment as indicated by the notations of months and days entereed in the column titled "entlassen" [release] and by the desertion date of many a sailor. Most voyages list a time of service in months and days. I am assuming that a sailor stayed on the ship in question for the period of time listed. For instance Henry Blanck signed up on the NEW YORK in April 1870. The length of service is listed as 4 months and 9 days. The NEW YORK left Bremen on or about April 6, 1870. She made two crossing between Europe and New York returning to Bremen at the end of July 1870. I assume that Henry Blanck was aboard for both of those round trips. The size of certain crew lists. For example the Crew list of April 29, 1869 on the Steamship NEW YORK was only 33. Too small for the crew needed to man this ship. Heinrich Blank enlisted April 29, 1869 on the steamship NEW YORK. He spent over a year on this ship as indicated by the amount of time he served. Hermann Blank signed on the steamship NEW YORK in June 8 1869 and served for 3 months and 9 days. Both Henry and Hermann Blanck formed part of the crew between June 8, 1869 and September 1869. Yet they signed on at different times and left the crew at different dates. The Palmer List of Merchant Vessels states that the Steamship MAIN had "accommodation for 70 passengers in 1st class, 100 in 2nd class, and 600 in steerage; crew of 105." 52 crew members enlisted on November 4, 1870. I am assuming that another 52 (more or less) had signed up at a earlier date and had remained on board as crew. There seems to have been some role over effect. The number of crew remaining more or less constant but the actual crew members changing over time. "Desertion" was fairly common. I do not know if there were penalties involved. Many of the men who "deserted" (including my ancestor, Berend Petermann) returned to the German merchant crews and sailed again at a latter date. It would appear that many "missed" rather than deserted. On the other hand, some men probably did enlist in Bremen with the intention of deserting in New York (or some other port). The Bremen, German Desertion of Sailors 1855-1874 records list 142 desertions for men from Lehe to New York City including Henry Blanck. There were others deserting in other cities in the United States. Henry Blanck's future brothers-in-laws, Henry and Fredrick Erxmeyer (in 1871) and Johann Lehman (in 1873), also deserted ship. 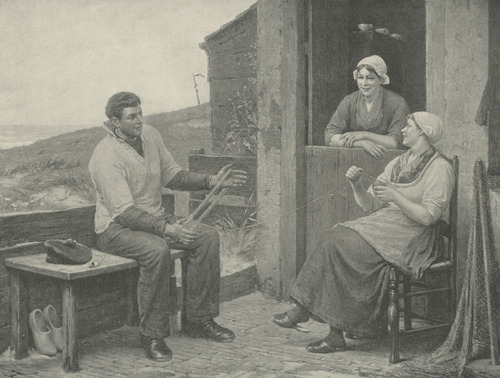 Frederich Erxmeyers bother-in-law, Heinrich Reddehase deserted in 1873. My great grandfather, Johann Berend Petermann, deserted in 1864. However, Berend went back to Germany, served again as a merchant sailor, and immigrated to the US at a later date. 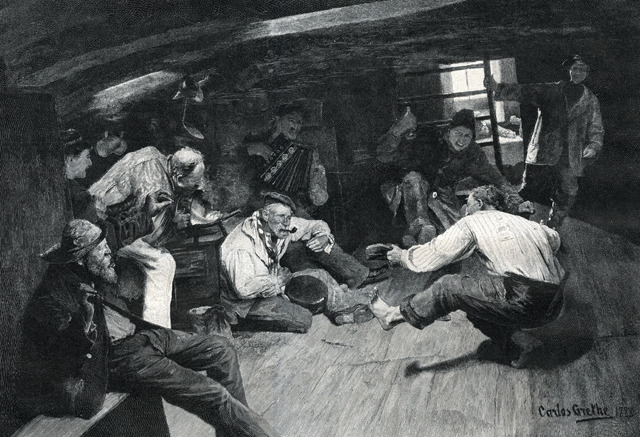 According to Bremen, German Desertion 1855-1874 6,374 sailors deserted ship between 1855 and 1874 in the Port of New York. There were 136 to Hoboken under a separate listing. This is taking into consideration only one port of departure from Europe and only one port in the States. There does seem to have been some effort to discourage desertion as indicated by this statement in Fraser's magazine in 1874. "Although they lie alongside the wharves of the great cotton ports for weeks, desertions are of rare occurrence. I have often marvelled at this, as their wages are lower than the English, and the crimps are constantly tempting them with highly remunerative offers. It is true the Germans have a consular treaty (we have not), which gives their consuls the power to imprison a deserter. Should they hold any property at home it becomes forfeited to the Crown; and as every man is registered, this is not a dead letter." 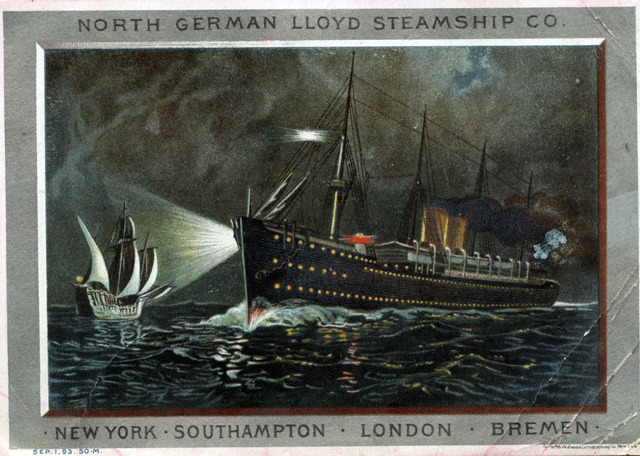 The transatlantic steamer line North German Lloyd (Norddeutscher Lloyd) of Bremen was founded in 1857 and consisted of three steamers running to England. Four screw steamers were subsequently purchased to make the transatlantic run between Bremen and New York. The first of these screw steamers made her maiden voyage in June 1858. Initially the main business of the North German Lloyd was the transportation of emigrants from Germany to the United States. However, the returning cargo was more uncertain. As a consequence they started lines to The West Indies and South America. In addition to the press of emigration other changes had occurred after 1870 with encouraged an increase in shipping. These included the development of steam ships, commercial and navigational treaties, the reduction in pirates, and the opening of East Asia. In 1870 the Bremen merchant marine was made up of 27 steamers. By 1898 it was made up of 259 steamers. 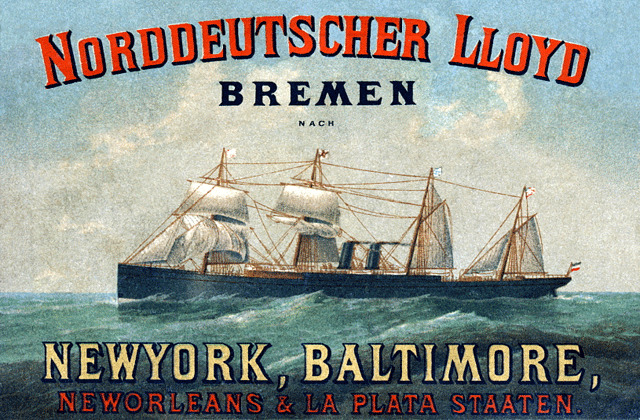 In 1872 the Norddeutscher-Lloyd started two weekly steamers from Bremen to New York, and a weekly steamer to Baltimore, and also extended its connections with South America. "As is so often the case, the success of this great company is said to be mainly due to one man, the late Mr. H. H. Meier, who for many years was its life and soul. He succeeded in amalgamating the various steamship companies then existing and forming out of them this company, which has gradually become one of the greatest steamship companies in the world. In June, 1858, the New York line was opened via Southampton, with the screw steamship Bremen (318 x 40 x 26), 2674 tons, followed by the New York, Hudson and Weser, all built by Caird & Co., of Greenock. These boats were so satisfactory that for a great many years they confined themselves to this yard. In all, Caird & Co. are said to have built some forty ships for the company. In 1862 and 1863 the Hansa and America, followed by the Hermann, Deutchland, and Union, were added to the line, all built by Caird & Co. 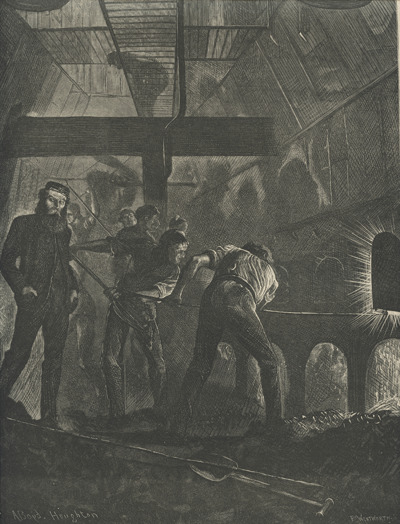 In 1866 it became necessary to establish a weekly line to New York, and the following year the fleet numbered fourteen steamers, of which eight were in the New York trade and six in the English. In 1869 the company extended their operations to New Orleans, and in 1870 to the West Indies; in 1875, to Brazil and the River Plate. Most of their boats have been called after the principal rivers of Germany. A printed return shows that in 1874 the average weekly passages westward from Southampton of the company's boats, Donau, Moselle, Hermann, Hansa, Weser, Rhein, Main, America, Oder, Neckar, Deutchland, Hohcnstauffen and Hohenzollem, was 11 days 13 hours, the Main making the quickest in 9 days 14 hours 20 minutes. Eastward, the average for the same year was only 10 days 8 hours 58 minutes, the Moselle making the quickest in 9 days 8 hours and 50 minutes." Most German ships were made up of entirely German crews with an occasional Scandinavian or Dutchman. 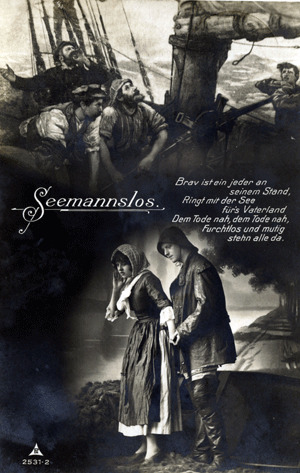 Most of the German seamen came from the north near the coast and spoke a North German dialect. 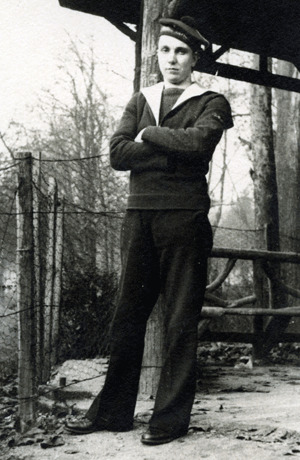 The German seaman had a reputation as being well disciplined, hard working, and sober. 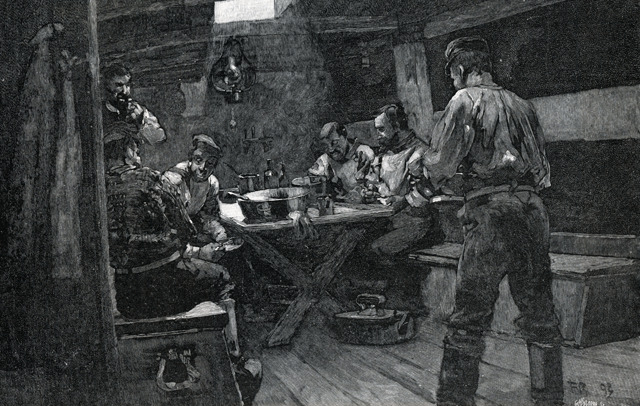 "Nor does the German seaman disdain a small refreshment, but his self-respect, and higher degree of cultivation, keep him from degrading himself in a similar manner, although of course there are exceptions. 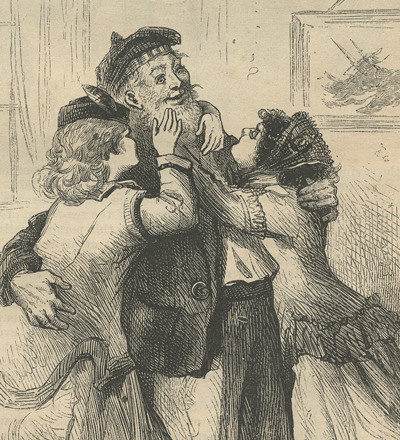 He has had his pleasure, and has visited the neighbourhood and everything worth seeing, so he is content, and spends the rest of his money in keepsakes, and curiosities for his relations; he is a German and thinks always of the dear ones at home." German Merchant ships were bound to transport home any German seaman found in need in a foreign country. In 1868 North German Lloyd ships were carrying passengers, mail, money and cargo. "American Mails. - Southampton Sept. 15. - The North German Lloyd screw steamship Deutschland, Captain H. Wessels, arrived this morning, with mails of the 3rd inst., from New York, 110 passengers, $104 907 in specie for England, and 1,000 tons of cargo for Bremen. Light easterly winds, with heavy swell, and generally fine weather, were experienced on the passage. On the 12th, at 6 p.m., in lat. 49 41 N, long. 23 43 W., the Deutschland spoke the English bark Egmont. 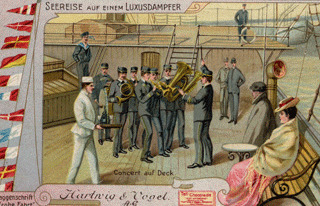 The North German Lloyd screw steamship Union, Captain H. J. von Sauten, sailed hence this afternoon for New York, with English, French, and German mails, 158 cabin passengers, jewelry from Havre value 125,000f., and a full cargo of general merchandize. The new steamer Rhein, belonging to the same company, left Greenock for Bremen on Sunday last, and will sail from Southampton on the 6th proximo, on her first voyage to New York." 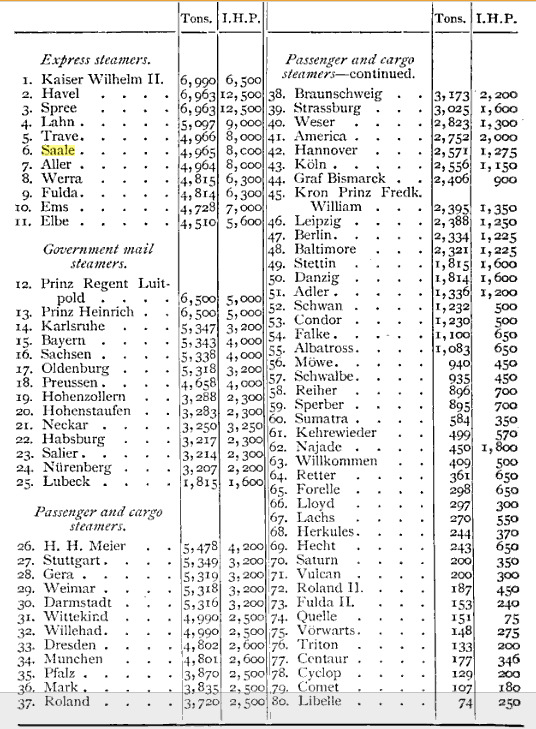 In July and August 1870 the following ships were advertised as running from Bremen via Southampton to New York: Rhine, Donau, Deutschland, Main, Weser. In July and August 1870 the following ships were advertised as running from Bremen via Havre to to New York: Hansa, New York and Hermann. The Bremen was going directly from Bremen to New York. 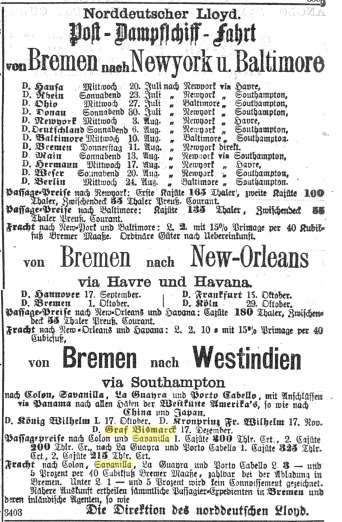 The Ohio, Berlin and Baltimore were going Bremen via Southampton to Baltimore. The Hanover, Bremen, the Frankfurt and the Koln were running from Bremen via Harve and Havana to New Orleans. The Konig Wilhelm I, the Kronprinz Fr. Wilhelm and the Graf Bismarck went from Bremen via Southampton to the West Indies: Colon, Savanilla, Curacao, La Guayra, Porto Cabello with connection via Panama to the West Coast ports of America and on to China and Japan. This 1873 ad for the North German Lloyd shipping line listed the ships and their destinations. In 1879 the North German Lloyd advertised 8 steamships traveling between New York and Bremen every Saturday: the Neckar, the Oder, the Mosel, the Rhein, the Main, the Donau, the Weser and the America. My ancestors and their relatives were Merchant Seamen who sailed out of Bremen between the 1830s and the early 1870s. Consequently my focus is on the Bremen ships of that period - specifically the ships they actually served on. 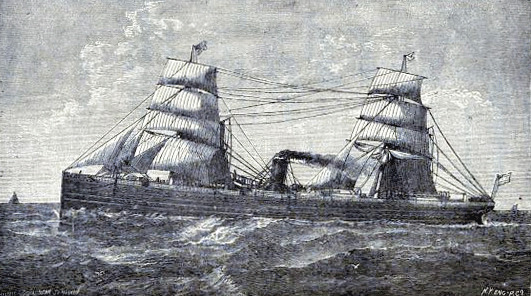 The AMERICA was on the Bremen to New York Route from 1863 to 1894. J. Berend Peterman was on the AMERICA from September 30, 1872 to about May 12, 1873. See Berend Petermann at Sea for details of crossings for this ship. 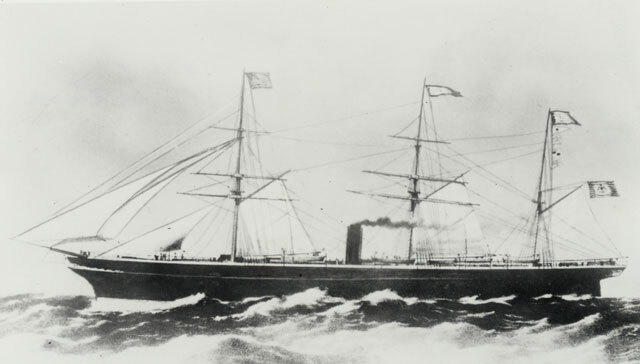 The German Lloyds new steamship AMERICA sailed from Southampton on the 27th of May, 1863 arrived June 7, 1863. The new screw steamship Baltimore, 2200 tons, built by Messrs. Caird and Co., for the North German Lloyd's, for their new line of Bremen and Baltimore traders, which has been lying over at Gareloch for the last two months, was towed back to the Victoria Harbour, Greenock, a few days ago. Her shaft, which has been made in Germany, having arrived, she will now be completed. On the 23d of March, 1869, the steamship Baltimore, the pioneer vessel of the North German Lloyd line between Baltimore and Bremen, arrived in the harbor, and four days later the commercial interests, the civic authorities, and the population in general, celebrated the establishment of regular steam communication between Baltimore and Europe with an elaborate demonstration of their gratification. 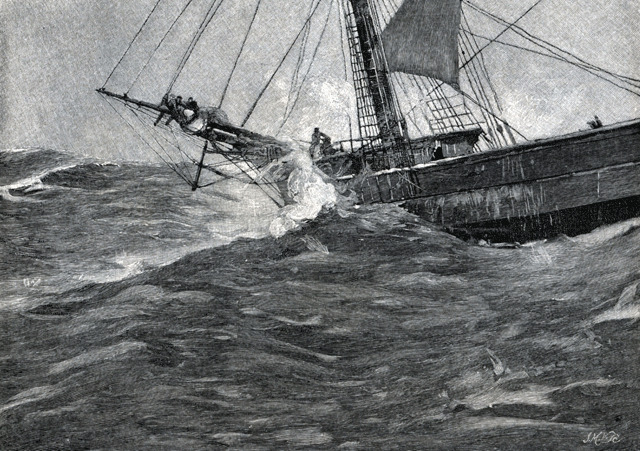 Wreck of the BALTIMORE off Hastings 1872. The North German Lloyd's steamship Baltimore, which arrived at Southampton on the 22d ult. 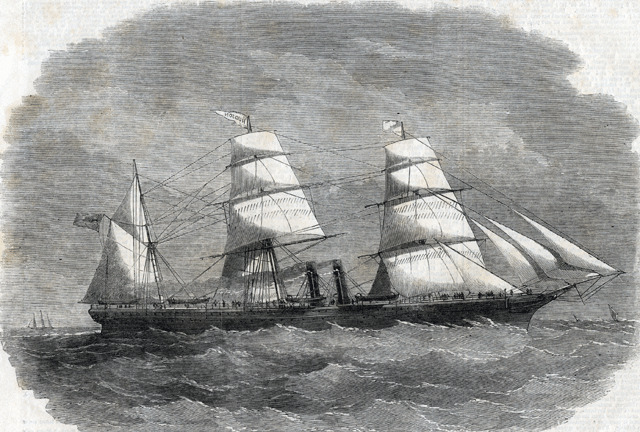 from Baltimore for Bremen, and subsequently sailed for her destination, on the following night came in collision, off Hastings, with the Spanish steamship Lorenzo Semprum. The Baltimore had a large hole stove in her hull, and the fires were soon extinguished, not however before the steamer had been run aground. The crew and passengers were all landed in safety. 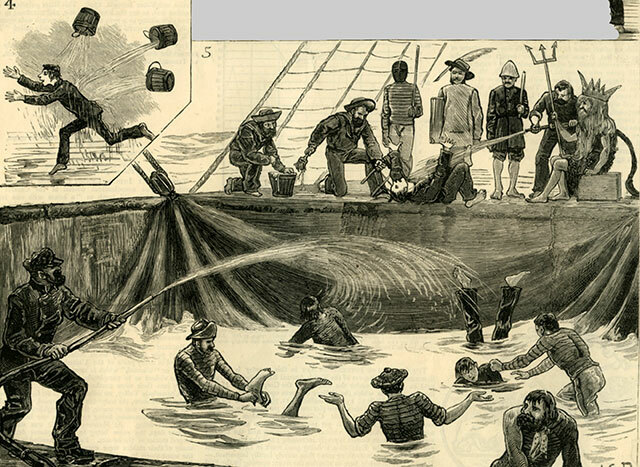 The steam-ship Baltimore trading between Bremen and Baltimore was hit by the Spanish steamer Lorenzo Semprun in the Channel near Hastings about midnight May 22, 1872. She had departed Baltimore on May 9th. 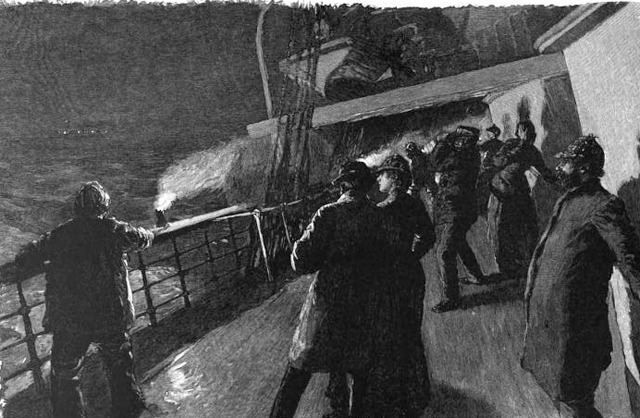 Captain Deetjan of the Baltimore, having determined that there was a large hole in the starboard bow, turned her towards shore "guided by the lamplights on the Marine Parade at Hastings". Rockets were fired which were seen by the coastguard who immediately came to the rescue. Taking on water quickly she ran aground about a third mile from the Marine Parade, her head having gradually sank. There were 130 passengers and 80 seamen on board. All were safely brought to shore. All of the luggage was salvaged. The forward compartment was filled with water. The ship lay in about 8 feet of water at low tide and many people went out to the Government House coastguard station to take a look. The Baltimore was towed to Southampton for repairs. She had been on her way from America to Bremen "Laden with tobacco, molasses and lard". On setting sail from Baltimore her captain was named Fisher. It appears he died at sea. "Captain Fisher had died on the voyage, and Mr. Deetjan was in command. She had put in at Southampton and landed her English passengers, on the Wednesday, leaving Southampton at four o'clock that afternoon. 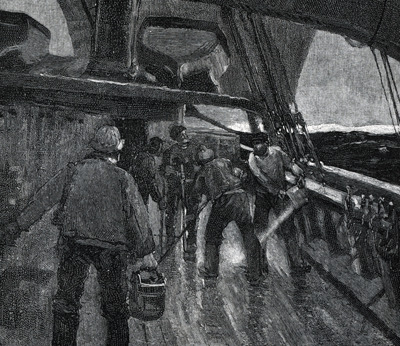 The Spanish steamer, on her way from Aalsund to Santander with a cargo of fish, received great damage from the collision, but was enabled to reach Southampton on the the Thursday afternoon." Steamship Bremen, (Ger.) Ladewigs, Bremen. Dec. 7, and Southampton 10th, with mdse. and passengers to Oelriche & Co. 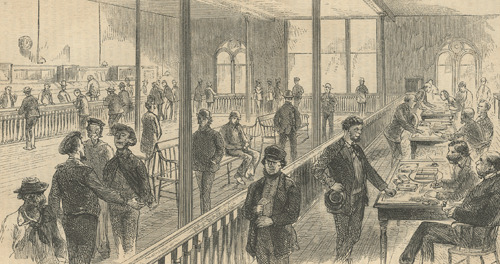 The Bremen was listed in violation of overcrowding laws on vessels arriving in the port of New York in April 1872. She was carrying 749 passengers - an excess of 150 passengers. 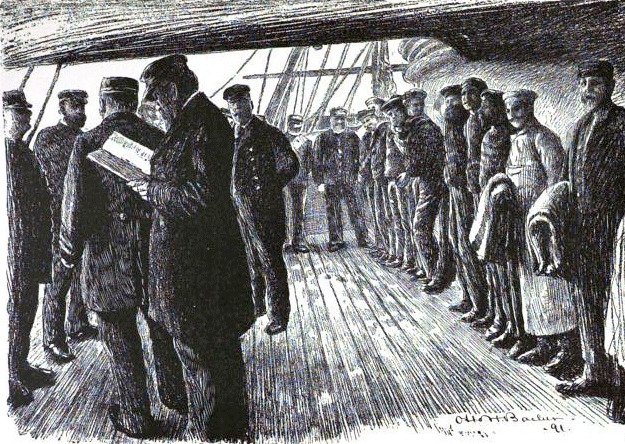 (Senate 1873 Steerage Passengers on emigrant vessels). The Bremen arrived April 15, 1872 and according to the ship's manifest was listed with 25 cabin passengers and 817 steerage passengers. The Bremen was the first of the North German Lloyd ships to make a transatlantic crossing between Bremerhaven and New York. She left Bremerhaven under the command of Captain Wessels late in the evening on June 19, 1858 with 1 first class cabin passenger, 21 second class cabin passengers and 96 steerage passengers. According to the Manifest she arrived in New York on July 6, 1858. In 1858 three more steamships were added to the line: the Hudson, The Weser and the New York. Tonnage: 2,551. Dimensions: 321' x 39'. Single-screw, 10 1/2 knots. Inverted engines. Three masts and one funnel. Iron hull. Clipper bow. Passengers: 150 cabin, 800 third. Note: Pineer steamship of the North German Lloyd. 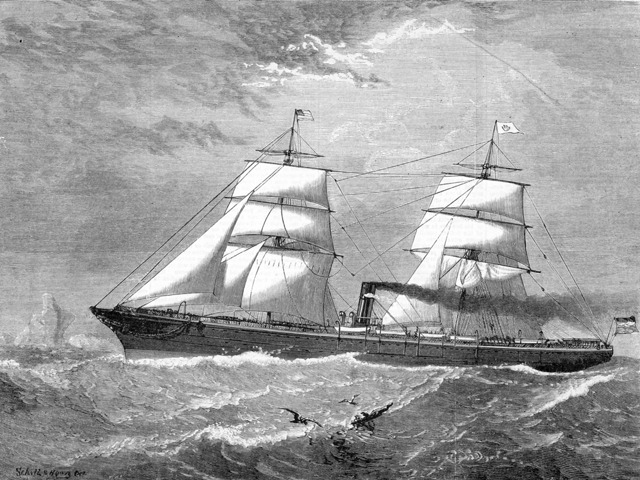 Maiden voyage: Bremen-New York, June 19, 1858. Made her last voyage for line in November 1873. Sold to British shipowners in 1874 and converted to sail. 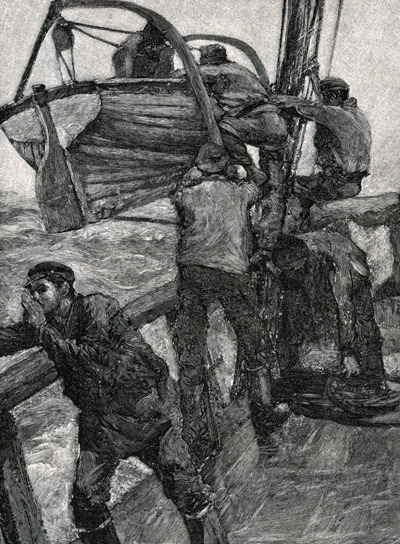 Wrecked of San Francisco in 1882. Running mates: New York (identical), Hudson and Weser. The Erxmeyer brothers, Fredrick and Henry, and their brother-in-law, Johann Leham sailed on the Donau. Fred Erxmeyer was on the Donau from December 1868 to August 1, 1871. Henry Erxmeyer was on the Donau from April 1871 to August 1. 1871. Johann Lehman was on the Donau starting in July 1871. I do not know when he left this ship. Fred Erxmeyer's wife, Charlotte Erxmeyer emigrated on the Donau in 1871 Charlotte Erxmeyer, age 25, traveling with Charlotte Erxmeyer, age 7 months, and Marie Erxmeyer, age 9 years arrived on September 4, 1871 aboard the S.S. Donau from Bremen to New York (Donau Ship Manifest) Sailings for the Donau were not listed in 1868 per Abfahrtsdaten von Auswandererschiffen. Sailings from January 1869 to July 1871 were as follows. (European's list the day then the month). The Little Western, a 16 feet fishing dory, sailed from East Gloucester on June 12, 1880 bound for England and manned by George P Thomas and Fredrick Norman. She ran into several steamers who thought she was in distress. Coming upon the dory Little Western the Donau was delay an hour to determine that everything was okay. The commander of the North German Lloyds steamship Donau, in a letter to the newspapers, complained of an hour's delay to his vessel, caused by his supposition that the dory Little Western contained shipwrecked persons. He says the experiment of crossing the Atlantic in small boats is now only a sporting venture, made for money and notoriety. Every shipmaster is morally obliged to investigate small boats, to discover whether they are cases of distress. It is to be feared that some shipmasters, after being fooled in the way he was in regard to the Little Western, may not pay attention to the cases of actual urgency if these sea tramps continue to cross the ocean. The steamship Donau sailed to day for Europe with $1,051,200 in specie, including $5,000 for Harve. The whole amount was in Mexican dollars The Evening Telegram September 23, 1869 Philadelphia. The steamship Donau arrived in New York from Bremen, January 10, 1871. The steamship Donau from New York touched at Southampton, April 4, 1871. Exports cleared for foreign ports indicate the following shipments on the Donau. *a strong fiber from tropical American plants used for making rope. August 7, 1871 Donau for Bremen 6 bales Furs, 555 tcs Lard, 4,399 bushels Wheat, 326 bbls Resin, 223 hhds. Tobacco, 1,020 seroons Tobacco, 13,694 bushels corn, 249 boxes Cheese. Also 2,003 bags of Rio Coffee "by the Donau, were sold on private terms"
J. Berend Peterman was on the GRAF BISMARCK August 4, 1871 to February 5, 1872 and again from February 5, 1872 to July 25, 1872. J. Berend Petermann made two tours of duty on the Graf Bismarck serving from August 1871 to July 1872. Johann Leham made one tour of duty on the Graf Bismarck serving from February 1872 to July 1872. Sailings for the Graf Bismarck were not listed in 1871 and most of 1872 per Abfahrtsdaten von Auswandererschiffen. The first listing for 1872 was for August. The Graf Bismarck of the Bremer line was launched at Greenock, Scotland on November 11, 1870. To the West Indies via Southampton to St. Thomas, Colon, Savanilla, Curacao, La Guayra, Porto Cabello with connection via Panama to the West Coast ports of America and on to China and Japan. Great Anxiety is expressed for the safety of the steamer Graf Bismarck which left Bremen for this port three weeks ago via Southampton, where she took passengers and cargo, leaving there on the 15th of February and has not since been heard from. The Graf Bismarck ran into a hugh hurricane in the Atlantic. A STEAMER PUT TO THE TEST. 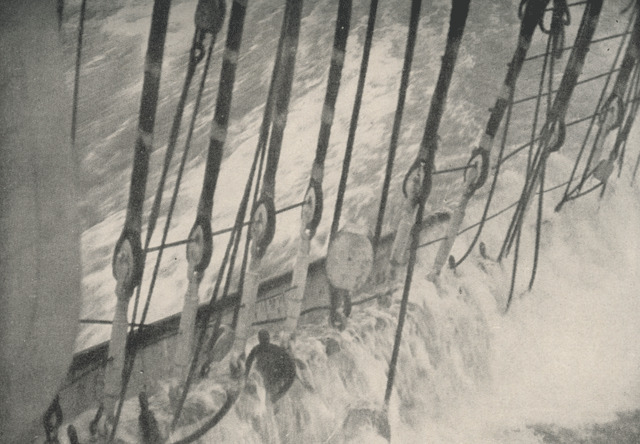 The North German Lloyd steamer Graf Bismarck, Captain Meyer, which arrived at New York on the 6th of March, made the stormiest passage of ihe season. On the 12fch of February she left Bremen, with well-filled coal bunkers, 5000 bags of malt, and a large assortment of general merchandise. 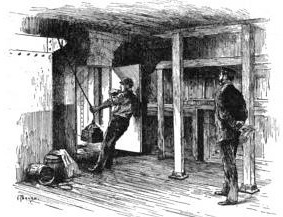 In the cabin were 12 passengers, and in the steerage about 40. On the 15th the steamer touched at Southampton. On the 24th a gale developed into a hurricane, which continued without interruption for 36 hours. During this storm threeboats were stove, the cabins several times flooded with water, and crockery, &c, destroyed. On February 27th, another hurricane overtook her - this time accompanied with thunder and lightning. For ten hours the gale continued, with a force and violence which momentarily threatened to engulf the steamer and all on board. During six of these hours the ship refused to mind her helm, leaving her practically at the mercy of the wind and waves. 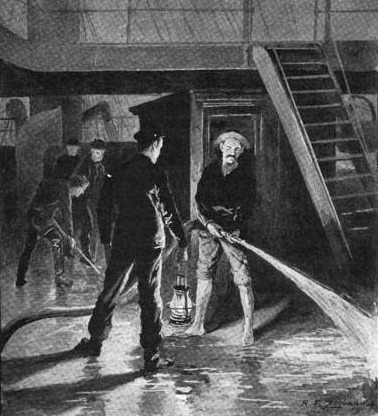 The sea during this storm is described by Captain Meyer as being more violent than anything he had ever seen before during the whole of his professional service. The ship was at times literally almost drowned amid the billows. 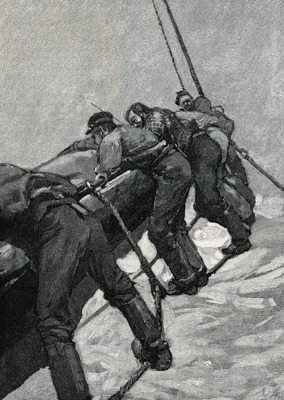 During the lull which followed this storm, the Bismarck encountered large ice-fields, and among them a number of icebergs, some of them nearly one hundred feet high. This was in latitude 46 degrees north, and longitude 47 degrees west, in the open ocean, where icebergs at this season of the year are rarely visible. Ice is rarely, if ever, seen in this part of the Atlantic until the last of March. After parting company with the icebergs the Bismarck was enveloped in a snow storm of 15 hours duration, in which it was impossible to see the length of the ship, and the snow accumulated on her decks to the depth of a foot aud a half. But the ship weathered all these storms. She is Clyde built - we believe by Caird and Co., Greenock. The Steamship Graf Bismarck arrived in New York March 6, 1874. The Graf Bismarck made her final voyage to New York in 1890. 1869 Rebuilt: lengthened to 395.1ft, fitted with compounded engines by J. Jack & Co., new tonnage: 3,847 gross. Heinrich Reddehase born Lehe 1850 deserted from the Konig Wilhelm in New York 5 November 1873. 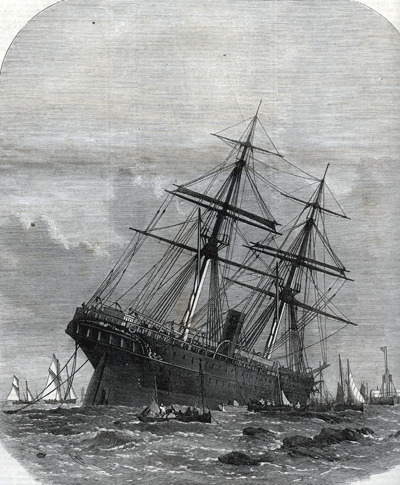 The Konig Wilhelm 1st arrived in New York from Bremen on the 1st of November 1873 under Captain Joh Gerdes with 288 passengers, one death at sea. First class 27, second class 15. Note: I cannot find Heinrich Reddehase in either the crew lists or the registry. The screw steamship " Konig Wilhelm I.," built and engined by Messrs. Caird and Co., of Greenock, for the North German Lloyd New Steam Line to tho West Indies, had her official trial trip on Saturday last, when she ran the measured mile at Skelmorlie at the rate of 12 knots per hour, at slow steam pressure, with 1,200 tons dead weight on board. She measures 2,450 tons (registers 1,69) tons), is 330 ft. in length, 39 ft. beam, and 31-ft depth from spar deck, and is fitted with engines of 350horse power. Accommodation is provided for 103 first-class passengers, 50 second, and 500 third, and she will carry from 1,800 to 2,000 tons of dead weight (fuel and cargo), her draught of water being about 20f t. when so loaded. The "Konig Wilhelm I." is the first of a new line of steamers on the eve of being started by the North German Lloyd to the West Indies, commencing at Bremen, calling at Southampton, and proceeding thence direct to Colon, Savanilla, Porto Cabello, La Guayra, and then back to Savanilla and Colon. At the last-named place the return voyage begins, only interrupted by calling at St. Thomas, the next ports being Cherborg, Southampton, and Bremen. The second vessel for this line, the " Kohn," was to have her trial daring the present week, and another, the "Graf Bismarck," is just launched. These steamers are built and fitted with special adaptation for the passenger and cargo traffic of the station on which they are to be placed. The " Konig Wilhelm I." leaves Greenock for Bremen on an early day. Southampton July 28, 1873 the North German Lloyd's steam-ship Konig Wilhelm I from New York July 16 for Bremen. Ran aground in Holland, Nov 11, 1873 while bound from Bremen to New York. Reportedly there was no loss of life. A similar race has just accidentally occurred between the City of Paris and the North German Lloyd screw steamship Main, Captain K. von Oterendorp. Both these magnificent vessels left New York on June 15, within an hour and a half of each other, the Inman steamer having the start. The City of Paris arrived off Queenstown 12.15 a. m. on the 15th. Queenstown is nearer to New York by about 280 miles, or 22 hours steaming, than Southampton, and the Main, had her destination been Queenstown, would have arrived at 1.15 p.m. on the 14th inst. As she left New York 1 hours later there was a result in her favour of l and a half hours over the celebrated Inman steamer. Neither company permits any racing, but every act of seamanship was doubtless exercised on board both vessels. Note I do not understand the dates. The steamship Main from Bremen arrived New York Feb 19 1870. The steamship Main arrived in Southampton March 9, 1870. The steamship Main arrived New York from Bremen April 8, 1870. The steamship Main arrived from Bremen to New York July 1, 1870. 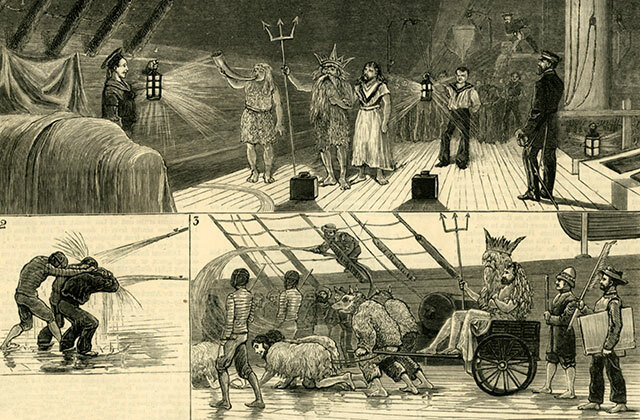 The steamship Main from New York touched at Southampton March 7,1 1871. 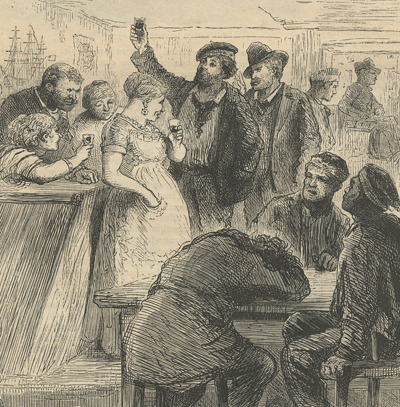 In 1876 the MAIN sailed from Southampton to New York with £81,000 in gold coin and bars. The second marine wrestling match referred to took place last Saturday night, between the North German Lloyd steamship Main and the schooner Seth M. Todd, about 30 miles southeast of Fire Island. The Main had sailed from this port on that day, on her outward voyage, and the schooner was bound from Alexandria to Boston. The latter was almost completely wrecked, and the steamer put about and towed her to the Sandy Hook lightship, whence she was brought into port. The steamship Main of the north German Lloyd left Hoboken at 2 on an broke her shaft while crossing the andy Hook bar at 4:45. A tug was sent to try and pull of the bar at high tide. 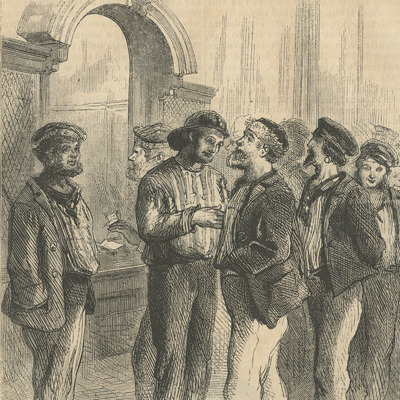 The Main was described as having fifty-six cabin passengers and a considerable number of steerage passengers as well as carrying a full cargo of rye, tobacco, cotton and miscellaneous. "The Main is one of the oldest vessels of the line. She was built in 1868." (New York Tribune July 15, 1883). The MAIN made her final voyage to New York in 1890. 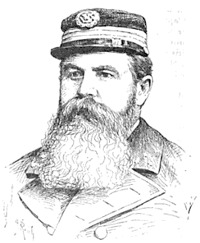 Henry Blanck was on the NEW YORK from October 1868 through July 1870. Initially he was a "sculleryman" (a kitchen worker) but on his last trip he was a steward. See Henry Blanck at Sea for more information about the arrival and departures of the New York between 1868 and 1870. Steamship New-York, (N. G.) Nordenholt, Bremen Jan 2 and Southampton Jan 5th, with mdse. and 374 passengers to Oelrichs & Co. Experienced strong westerly gales during first part of passage. Jan. 13 lat 46 56 lon 48 56 passed a Br. 4 master steamer bound E.
The New York sailed for Bremen from New York on January 29, 1869 March 10 1869, New York Times: The Steamship New York from Bremen Feb 20 and Southampton Feb 23 reached New York March 9. MARCH 9.--In steamship New-York. from Bremen--Mr. and Mrs. Ostheim. S. and J. Colinfeld. Isaac Walker, Mr. and Mrs. J. Pickersgill, J. Negbaur, Miss Von Wyk. M. Bock, Charles Wilken and family, Ad. Bockelmann, Robert Unit W. I, Mrs. Cath. Hofen, George Spangerbing, W. Wigger, H. Wigger, Miss Clara Neirffer, T. Frankenthal, M. and T. Felsenheld, Miss Rose Felsenheld, J. Bamberger, Mrs. Freeman, Miss Breill, J Ward, Mr. Walker and family, M. J. Gough and family, Johan Streidbeck, Mr. Batte, J. Adams, W. Rabenstein, George Gilbert, David Howard, W. White, H. W. Stike, E. W. Philgard. Two family members were connected to the WESER: Wilhelm Lange was a crew member and Julia Erxmeyer Lehmann and her daughter were passengers. The Weser arrived in New York 26 April 1872 Capt Willegrod with 749 passengers. ARRIVED Stream-ship Weser (N. G.) Willigerod, Bremen april 13 via Southampton, 16th wid mdse, and 749 passengers to Oelich & Co.. Had light, variable winds mostley N. E. and westerly the entire passage; on the Banks covered sky, but little fog and a high S. W. rolling. April 22 lat 45.36, lon 47.5 passed bark Highland Mary (Br.) from Greenock for Savannah; 23d lat 45.18, lon 48.10 ship John Barbour, (Br.) bounr W.; 24th lat 42.55 lon 60.13 bark Alamon (N. G.) bound W. 25th, 219 miles off Sandy Hook, passed an Inmam steam-ship bound E.
Julia Erxmeyer Lehmann and her daughter "Julia" immigrated from Bremen through Southampton to New York on the Weser March 29, 1873. The ship manifest shows 710 passengers with two infants born at sea. Captain Willigerod, 12 first class passengers, 21 Second class and the rest steerage. "Arrived Steam-ship Weser (N. G.) Willigerod, Bremen March 15, via Southampton September 18 the with meds and 708 passengers to order"
The Weser sailed for Germany on April 6, 1873. In November 1867 the Weser, carrying 513 German passengers, crossed from Southampton to New York in 9 days and three hours. The Steamship Weser left Bremen February 19 and Southampton Feb 22 and reached New York early on March 5, 1870. 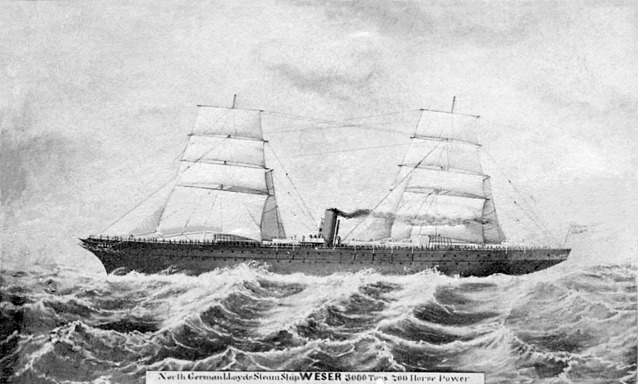 The WESER made her final voyage to New York in 1894. Wilhelm Willegerod was born in Verden in 1838 and lived in Bucken. He started his career in 1856 as a Matrose (sailor) on the Diana and worked his way up to an officer on the New York in 1868. He was the "former Captain of the Ems". He was Captain of the Bremen in 1870 and Captian of the Weser in 1872 and 1873. 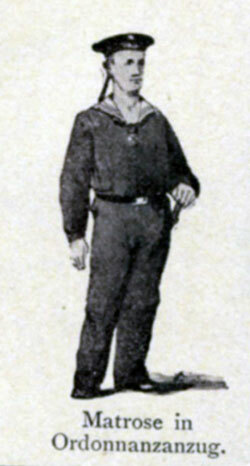 He was Captain of the Neckar in 1879. He was a also Captain of the Spree and other steamships. He celebrated his 200 round trip across the Atlantic in 1896. Wilhelm Willigerod visited his cousin, Oscar Willigerod, in Newark, New Jersey having arrived on 18 Oct 1910 on the Kronprinz Wilhelm. "In 1856 he went to sea in a sailing ship, and remained in sail till he got his first command eleven years later, when he was twenty-seven. Two years later he entered the present service, and in 1871 he was in command of the company s.s. Weser. This was then an important ship, she being then only three yean old, and of a gross tonnage of something like three thousand. A year later he distinguished himself by the rescue of a British crew from a sinking steamer - an experience which he has at inervals repeated throughout his long career. The most recent remember is the rescue of the passengers and crew of the illfated Abystinia, when that steamer was burnt in mid-Atlantic. That since he got his present ship. Other crews and other vessels various in nationalities have in the interval had to thank him for services rendered, and I need not dwell on them. When the North German Lloyd Company determined to start their express service, Captain Willegerod had the first vessel then built. This was the unlucky Elbe, and since that time he has had most of the new vessels as they came out. The Spree has been the vessel which has, perhaps, brought him nearest to serious disaster, and that through no fault of his. We all remember her breaking her shaft and holling herself aft some two or three years ago when she was towed into Queenstown with the water over the intermediate saloon flour, and the difficulty that Haulbowline Dockyard found in dealing with so long a craft. Since then, when in charge of a pilot, the vessel has made acquaintance with the coast of the Isle of Wight, and on both these occasions the captain has not only had the satisfaction of averting all loss of life, but has had his exertions rewarded by seeing them successful in the saving of all the property committed to his charge. The distance in nautical miles between New York and Bremen is 3,590. Although the ships that Berend Petermann, Henry and Hemmann Blanck, Frederick Erxmeyer and Henry Erxmeyer, and Johann Lehman sailed on were called steamers they also had sails. "overhaul time" about 12 stories high.
" Imagine such visitors as these coming aboard day and night for weeks, one after another without letup— and you have some idea of life in a while "running the easting down" on the long sweep with the prevailing westerly winds from the Cape of Good Hope to Australia! The reverse voyage around the Horn was of corse equally wet, until the ship worked far enough north to get into the southeast trades." 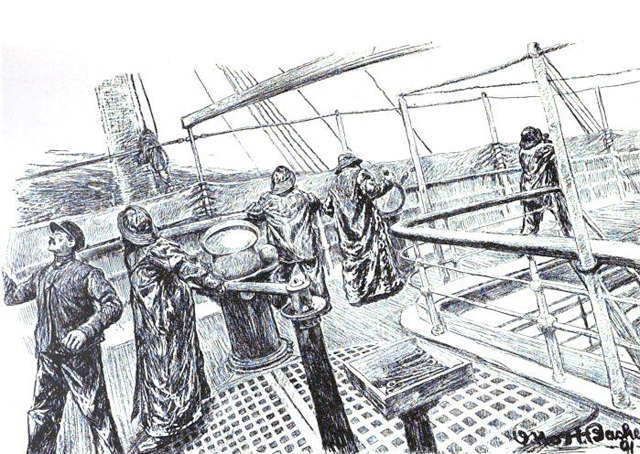 Ocean steamships: a popular account of their construction, development ... By French Ensor Chadwick, Albert Edward Seaton, William Henry Rideing, John H. Gould, James Douglas Jerrold Kelley, Ridgely Hunt, 1891. Water that does not run off the ship drains down into the "bilge" inside the ship. This water must be pumped out to keep the ship from taking on too much water and possibly sinking. The decks were washed every day. 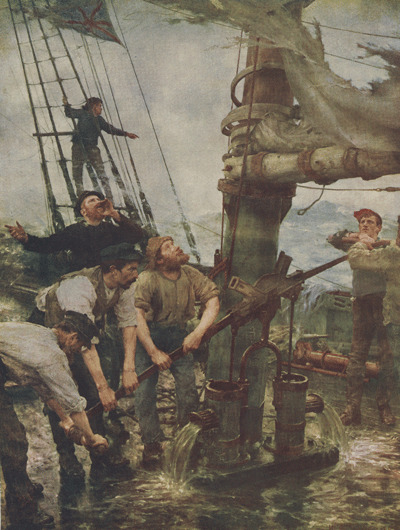 On many ships it was the duty of the morning crew. In warm weather, you cannot lie in bed after daylight in the morning. You get up about five o'clock, and if you want a marine bath you can have it at the hose with which the sailors are washing the deck. The deck is washed and scrubbed every morning, and made more beautifully clean and white than you will find any floor in Scotland. The hose is similar to that of a fire engine, and the water is pumped out of the sea by steam. 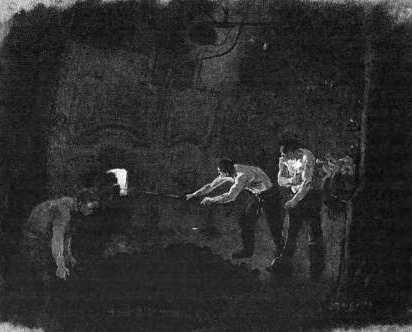 Work in the engine room especially as firemen was extremely punishing. It was hot and dirty work. 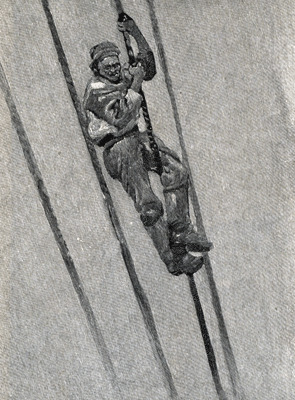 Deck Steward from Ocean steamships: a popular account of their construction, development ... By French Ensor Chadwick, Albert Edward Seaton, William Henry Rideing, John H. Gould, James Douglas Jerrold Kelley, Ridgely Hunt, 1891. The chief steward had an "army" of stewards under his command. Their main duties were to wait on passengers, particularly in the state rooms and saloons. Henry Blanck and John Lehmann were stewards. 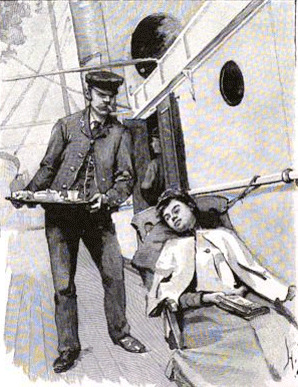 These images show a steward bearing drinks to the first class passengers. In the image on the left the steward is in the background to the left. In the image on the right he is the man wearing the white uniform. These type of images are known as cigarette or trading cards. These cards were advertising cacao and chocolate made by Hartwig & Vogel in Dresden. Specie Room of a Passenger Ship Ocean steamships: a popular account of their construction, development ... By French Ensor Chadwick, Albert Edward Seaton, William Henry Rideing, John H. Gould, James Douglas Jerrold Kelley, Ridgely Hunt, 1891.
plates which are riveted together and protected with steel doors. 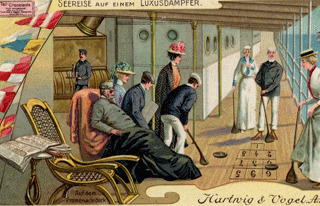 Voyage on a luxury steamer - training on the boat. Muster - inspection of the crew. The ceremony of Crossing the Line was an ancient hazing rite celebrated when a sailor crossed the Equator for the first time. The ceremonies frequently featured King Neptune, Amphitrite and Tritons all in costume. The ceremonies could sometimes last for two days and were often quite brutal. Baptism or emersion in water was almost always a feature. 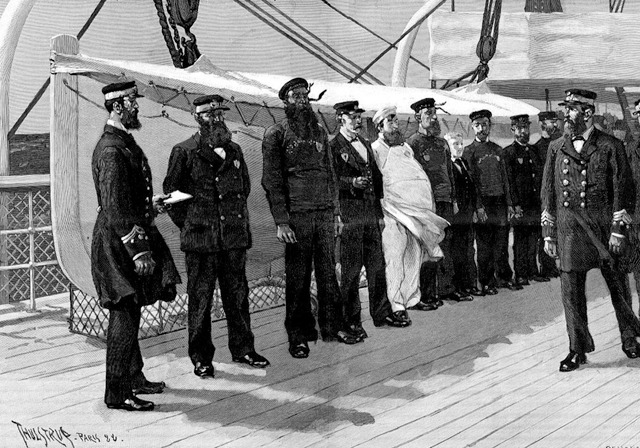 Crossing the Line, i.e., either the equator or the Arctic circle, was formerly the occasion, not only among merchant vessels and men-of-war, but also among whalers, for curious ceremonies that are now well-nigh obsolete. The details of the performance varied even among the ships of the same waters, but it always took the form of some tribute to Neptune exacted from such of the officers, passengers, or crew as had never before crossed the line in question. Captain Marryat, in " Frank Mildmay," gives a description which covers all the essential points. He represents the ship as being hailed from the supposed depths of the Sea the evening before the line is to be reached, and the captain is given the compliments of Neptune and asked to muster his novices for the sea-lord's inspection. The next day the ship is hove to at the proper moment, and Neptune, with his dear Amphitrite and suite, comes on board over the bow, or through a bridle-port, if the weather permits. "Neptune appears," writes Marryat, " preceded by a young man dandily dressed in tights and riding on a car made of a gun-carriage drawn by six nearly naked blacks, spotted with yellow paint. He has a long beard of oakum, an iron crown on his head, and carries a trident with a small dolphin between its prongs. His attendants consist of a secretary, with quills of the sea fowl; a surgeon, with lancet and pill-box; a barber, with a huge wooden razor, with its blade made of an iron hoop; and a barber's mate, with a tub for a shaving-box. Amphitrite, wearing a woman's night-cap with sea-weed ribbons on her head, and bearing an albacore on a harpoon, carries a ship's boy in her lap as a baby, with a marlinspike to cut his teeth on. She is attended by three men dressed as nymphs, with curry-combs, mirrors, and pots of Eaint. The sheep-pen, lined with canvas and filled with water, as already been prepared. The victim, seated on a platform laid over it, is blindfolded, then shaved by the barber, and finally plunged backward into the water. Officers escape by paying a fine in money or rum." To this day it is the roughest sort of rough man-handling, but it is a short shrift for those who take it good-naturedly, and, like bear-baiting, affords great amusement to the spectators. 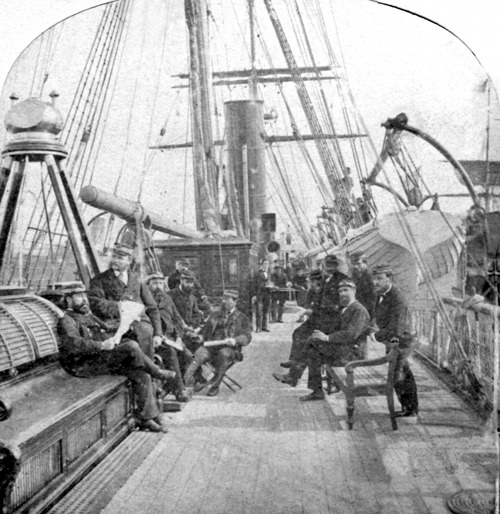 "Norddeutscher Lloyd steamship built 1865 at Greenock by Caird & Co. On this picture the ship's officers are seen gathered on the after deck of the ship. The image is from an old stereoscopic photograph. 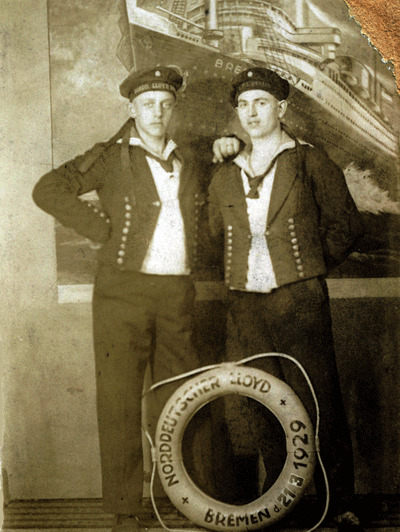 The bands on their hats read "Nord Lloyd Bremen"
The band on his hat read "Nord Lloyd Bremen"
In memory of my transit on the North Lloyd Bremen 1929"
The Sailor is alway true, he wrestles with the sea for his homeland, death is close, death is close, but fearless and courageous he always stands. Dated 4.1.1915 "Heinr Barkhausen, Lehe, Hafenstrasse 115" This was a photo studio. There is a message on the back hand written in German that starts" Mein liber Otto". I cannot read the rest. Written on the back in pencil "montrose" (sailor). Under the image are several lines of type. "Wir kommen und wir gehen. Es kann nicht anders sein Ob wir uns wiedersehen das weis nur Gott allein wir haben das gerfunden was sichdie Liebenennt so bleib wir ver bunden ob Meer und Land uns trennt"
The Sailors Artillery Barracks in Lehe was in existence by at least June 1886. 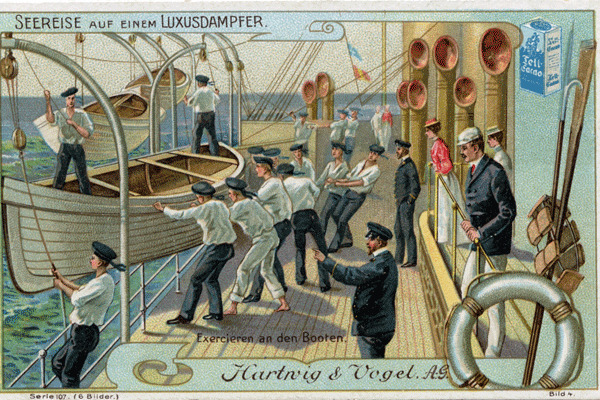 Norddeutscher Lloyd advertising card. 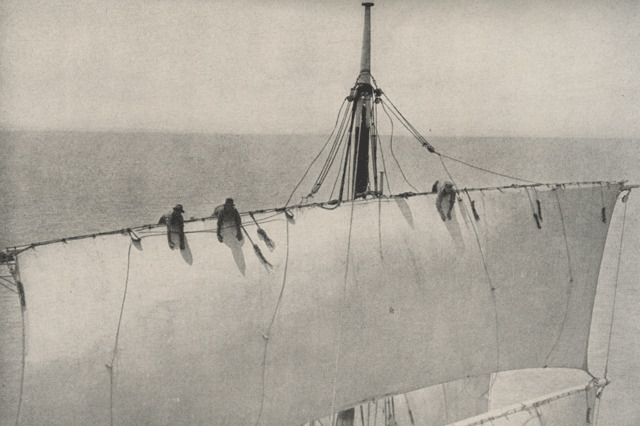 "Norddeutscher Lloyd - Bremen nach New York, Baltimore, New Orleans & La Plata Staaten". The ship on the advertisement looks to be a ship of the Werra class, a group of ships built about 1882. The Saale was a sister ship to the Trave and the Aller, all built in 1886. She was built by the Fairfield Shipbuilding and Engineering Company, (John Elder & Co. Govan, Glasgow). She was built to l accommodate 224 first class, 94 second class, and 850 third class (steerage) passengers in addition to officers and crew to the number of 170. The upper and main decks were of teak, and all deck houses were of steel and teak. The saloon was 50 feet long and 46 feet broad, and the interior fittings and ornaments were the work of the best decorators and artists of Germany. The woodwork was of oak, the hangings of red silk velvet, and the floor was covered with soft carpets, while the walls were hung with masterpieces of Munich artists. The ladies' cabin was furnished in blue plush and velvet, and the two smoking rooms in oak, with Japanese stamped leather. 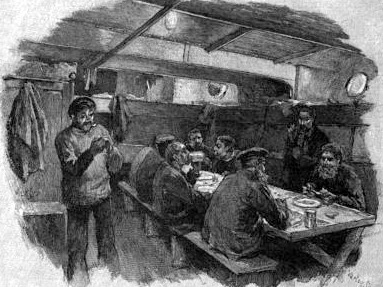 The second class dining room was on the main deck aft, and the steerage passengers were accommodated on the lower deck. All the modern improvements in the use of steam for navigation were adopted on the Saale, which carried 33 independent steam engines, with 65 cylinders. Her main engines were the largest triple expansion engines that had yet been constructed. The high pressure cylinder was 44 inches, the intermediate pressure, 70 inches, and the low pressure 108 inches in diameter, each was adapted for a stroke of 6 feet. All compartment bulkheads were closed with water-tight steel and iron doors, which were opened and closed from the deck, and an indicator under the eyes of the officer of the deck showed whether the doors were open or shut. In case of fire hose could be attached to pumps at 26 places on and below deck, and steam could be turned on in all parts of the ship. 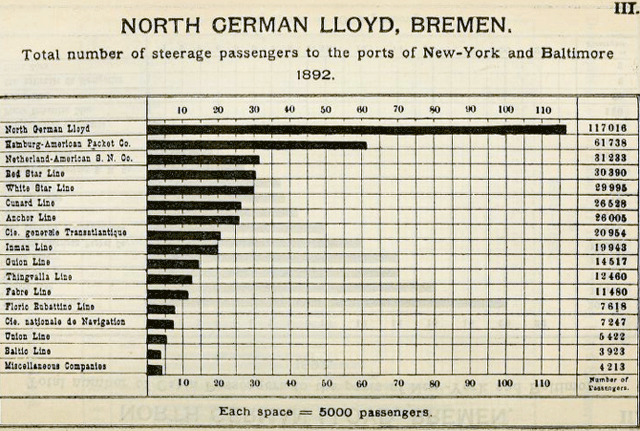 The North German Lloyd was the largest carrier of immigrant passengers for many years. In 1892 the line carried almost twice as many passengers as it's nearest competitor, the Hamburg-American Packet Co. out of Hamburg, Germany. During the years 1858-1895 the North German Lloyd steamers carried in the Transatlantic trade alone more than 3,000,000 Passengers. Southampton was the terminus and port of call of several of the large steamship companies. It was a stopping point for the North German Lloyd ships headed to and from New York, Baltimore and New Orleans. The time from Southampton to London by the Southwestern Railroad is about two hours and a half. Trains leave South- ampton for London every hour. After landing passengers, the mail and merchandise at Southampton the vessel headed down the river toward the English Channel. In the Channel the ship passed Worthing, Shoreham, Brighton, Beachy Head, Hastings, Dungeness, Folkestone, Dover (with its white chalk cliffs), South Foreland, Deal. The ship then enters the German Ocean. After passing Bordum and Norderney and the islands along the coast, Key-bouy indicates the entrance to the Weser River. the Key-buoy, designating the entrance into the river Weser, is rounded, the light-house next appears on the right, and on both sides the flat lowland is seen, with red-roofed houses and church steeples, and the old-fashioned windmills with revolving sails, peeping out among the trees. The steamer casts her anchor in the river, and the steamboat approaches to take off the passengers and their baggage. On the east side of the river lies Bremerhaven, Bremen' s seaport, founded here by the enterprising citizens of Bremen in 1827, on a parcel of land purchased from the kingdom of Hanover, and since enlarged by considerable additions. The docks are the salient feature of the town as seen from the river, and consist of three large, well-arranged basins, closed by heavy iron pontoons and flood-gates, and connected with the river through channels walled with solid masonry. The first of the docks was finished in 1830, the second in 1851, and the third in 1878 ; the latter is the most extensive. Between the docks and the river are the workshops and the dry-docks of the North German Lloyd. The docks are constantly filled with shipping ; one of them is entirely reserved for the petroleum vessels, with vast storage facilities for this article extending along the sides of the basin. The passengers land on the quay, a few steps from the track on which the special train is waiting to carry them up to Bremen. The cars soon leave Bremerhaven behind, and cross a level country of moors and heather, passing farm-houses with gray thatched roofs and storks' nests perched on their gable ends ; old churches and windmills, with huge arms sweeping the ground. After a ride of an hour and a half the train pulls up at the station in the City of Bremen. Across the Atlantic from New York to Southampton, Havre, and Bremen Published 1879 by S.D.L. Taunton, printer] . 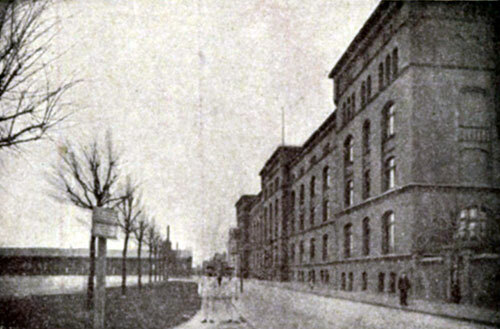 In Bremen: C. L. Brauer & Sohn, W. A. Fritze & Co., Fritze & Gerdes, B. Grovermann & Co., L. F. Kalkmann & Co., Gebr. Kulenkampff, G. Lange & Co., Joh. Lange Sohns Wwe. & Co., H. H. Meier & Co., der Nord - Deutsche Lloyd, Stockmeyer Mösle & Co., Johannes Tideman, Fr. M. Victor Söhne, D. H. Waetjen & Co.
B. Grovermann & Co. were the owners of the Schiff HUDSON on which J. Berend Petermann sailed to Grennland in the winter of 1859.